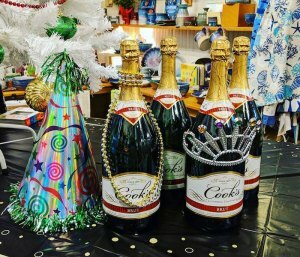 A first-person account of the OWWA Oyster Roast and NYE Open House at Books to Be Red. 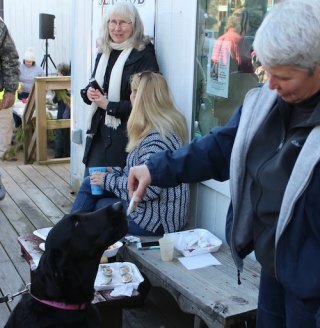 While New York City got most of the attention for New Year’s Eve festivities, Ocracoke hosted its own fun array of festivities. 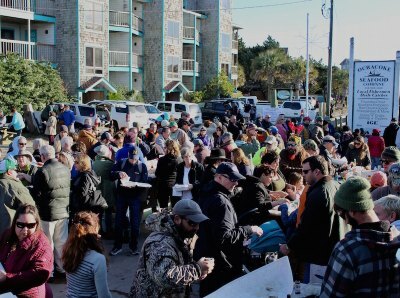 The 12th Annual Oyster Roast was a great way to kick off the weekend. The air temperature was mild (especially compared to the couple days before), the wind was non-existent, and the sun was shining. 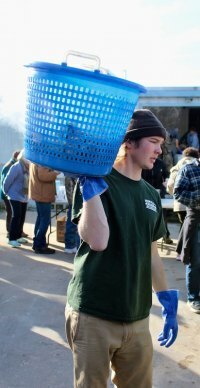 I’d never been able to attend the Oyster Roast, so when I realized I’d be off work that day, I asked my husband to go with me. Prior to moving here, Will wasn’t a big fan of oysters. In fact, he wasn’t all that interested in trying them remembering he didn’t much care for them when he was a kid. Then, a few years ago, I convinced him to try some fried oysters. Then he tried some steamed mussels. Since then he’s been hooked on shellfish. 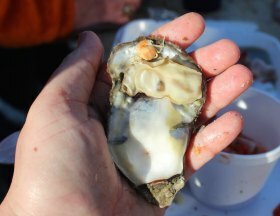 I’d always liked oysters, but I don’t recall ever having them raw until several years ago. For the past decade (excluding 2017), Sundae and Rob hosted a Boxing Day party at their home. At the very first of these I attended, I met Philip Howard (I was totally star-struck) and had my first raw oyster (I was instantly hooked). 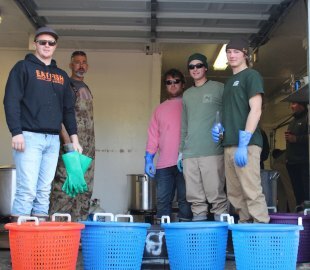 Working watermen Jordy Jenkins, Bill Evans, Morty Gaskill, Casey Tolson, and Logan Jenkins served up the oysters. In the years since, when given the choice, I go for raw oysters with cocktail sauce, but until late-February, I’ve got to have them cooked. Luckily, the word “roast” followed the word “oyster”, so Will and I knew we could both enjoy the local fare. I’d been looking forward to the Oyster Roast for weeks, frequently relaying that excitement to my mom when I spoke with her on the phone or over text. We walked from our house over to the Fish House around 1:50 Saturday afternoon. The line had already accumulated enough people to pass alongside almost all of The Jolly Roger. In line we saw Chuck and Bettina Meekens and met their friends Skip and Becky White, and then chatted with County Manager Bill Rich when he and some of his friends got in line behind us. We talked about Bill’s upcoming retirement, how a message from his wife Jennifer the previous day led to five sea turtles being rescued, and we all exclaimed what nice weather we were having. We were still too far away from the Fish House to smell anything, but the line was moving fairly quickly, so it wasn’t long before the scent of steamed seafood and fried fare drifted to us. I instantly went from completely content to starving. As we come upon the tables, we could see people standing closely together with their food placed in front of them, allowing us to get a glimpse of our near future. Steam was rising from the oysters that had been dumped at each end of the table, and although everyone was reaching for the tasty bivalves, there wasn’t any sort of disagreement. Cocktail sauce, vinegar, and Old Bay lined the center of the tables, and bins full of empty oyster shells were tucked underneath. 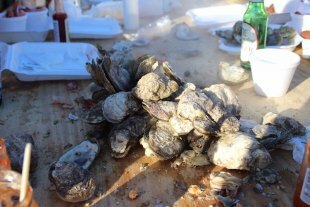 Woccocon Oyster Company had their own table set up where they were serving their freshly harvested raw oysters, and people chatted each other up while feasting on the fresh seafood and drinking cold soft-drinks or beer. By the time it was our turn to pay, I was ready to eat. Emily Lyons and Brooke Doane handed out to-go containers with fried drum, steamed shrimp, and hushpuppies. Once Will and I had our plates we had to find a place to eat. Luckily, a spot opened up and we joined Barry Burgan at the end of one of the tables. Spotting a bottle of malt vinegar, I grabbed it and doused my drum filet with it. Then I spotted the cocktail sauce and Old Bay, both perfect compliments for steamed shrimp. Before too long, a young man came out and dumped a big pile of freshly steamed oysters right in front of us! Barry, Will, and I each grabbed a few and dug right in. I dipped mine in cocktail sauce. I’m not really sure how Will and Barry ate theirs; after all I was focused on my own meal, but I do know that every oyster we ate was delicious. Atticus does his trick for Finley, while Debbie and Allison chat. After Will and I had satisfied our hunger, I walked off to take some photos, saying hello to familiar faces along the way. The line to get in to the roast was still quite long, and more people were lining up all the time. It was really quite a turn out! When I went back to rejoin Will I found him talking with Englishman Andrew Havenhand. We knew Andrew worked on the water and, wearing full-on fishing clothing, he was clearly working at the roast. After talking for a few minutes we learned he’s an art professor at Syracuse University! Andrew returned to work and I wanted to get a few more photos before we left. I found Finley Austin, Atticus Austin, Debbie Leonard, and Allison Serafin on the small porch in front of the Fish House. The women posed for a photo then Finley said to me, “Watch this.” Her loveable dog Atticus sat attentively in front of her and enthusiastically sucked down the oyster she offered him. 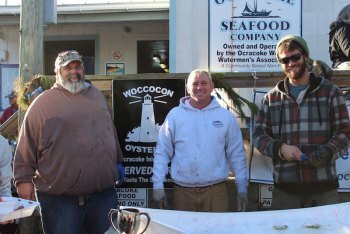 Albert O'Neal, Stevie Wilson, and Dylan Bennink of Woccocon Oyster Co.
We said our good-byes and headed home, but then got distracted when I remembered DESSERTS were being offered at the Ocracoke Working Watermen’s Association Museum! Of course we weren’t too full for a sweet treat, so we stepped inside and grabbed a few snacks. Side note: Whoever made the Key Lime pie, you rock. It was wonderful! After talking with Ocracoke resident Karen Burgan for a bit we wondered home. I may have fallen asleep on the couch for a short time. Having all that fun and eating all that delicious food was exhausting! Oyster and Crab -- a perfect combination! Sunday afternoon Leslie Lanier hosted a New Year's Eve open house at Books to be Red. Sunday’s weather was much more frigid than Saturday’s. The wind was stronger and the air temperature much lower. Still, Will and I braved the cold to do some shopping. 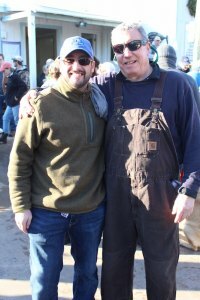 When we walked in the warm shop we were greeted by Leslie’s son Andrew and by the scent of clam chowder. I knew Leslie would be serving it there and had been excited about that since she created the event on Facebook, but it was still nice to smell it. I also just really really like going to Books to be Red, so everything about this outing was fun. The open house was heavily attended by lots of visitors and a good number of residents of all ages. Leslie was running a great sale on pottery, jewelry, and books and people were walking around with their hands full of goodies. There was even a raffle! 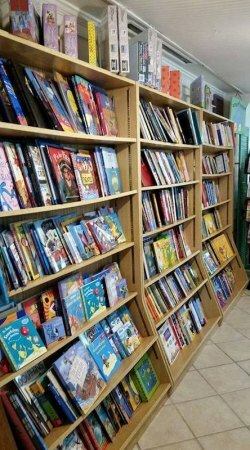 After serving up some clam chowder made by Leslie’s husband Beaver, I wondered down into the kids’ section for books, which was a stark change from the WWI and WWII books I usually read. Most of my book collection is from Books to be Red. When I found out that I was pregnant, Leslie was one of the first to know when I asked her to order What to Expect When You’re Expecting. And, knowing my interest in non-fiction historical narratives, Leslie keeps me up to date on books I might find interesting. They’ve all been great recommendations. Have I mentioned that I really really like this shop? Leslie knows how to get the party started at Books to Be Red. Between bites of clam chowder (which was packed with clams and chunks of potato in a broth – perfect for a cold day) and roll-ups made by Leslie with Feta, cream cheese, craisins, and green onion, I found some darling board books. Will found some Christmas books and we ended up purchasing a handful of cute stories for our little one who’s due in February! We saw Ocracoke residents Anna Rucker, Laura McClain, Sarah Fiore, Ruth Fordon, Debbie Leonard, Tory Kane, and Susie Hutchinson, plus conversed with visitors. The children's room is always well-stocked for kids of all ages.